(Yet another post about) Chinese New Year ! I realise that Jessie posted here right before I did about the Chinese New Year dinner hosted by the Malaysian Society. I attended and was glad that I did. I was one of the ones that wore red, because wearing something ang ang (red red in Hokkien and Teochew?) is a tradition that I will gladly abide by to rake in the prosperity and luck. I got to meet so many people and make new friends! However, I also found more activities to celebrate CNY hosted by the other societies that I, unfortunately, could not attend. There was a huge event jointly hosted by the Chinese Students and Scholars Association, University of Surrey and CSSA, Royal Holloway. I have not been able to celebrate CNY in Malaysia for 2 years now. It truly is one of the elements I miss the most while studying abroad. Back home, it would be the celebration that brought the whole family together and brings back so much nostalgia. 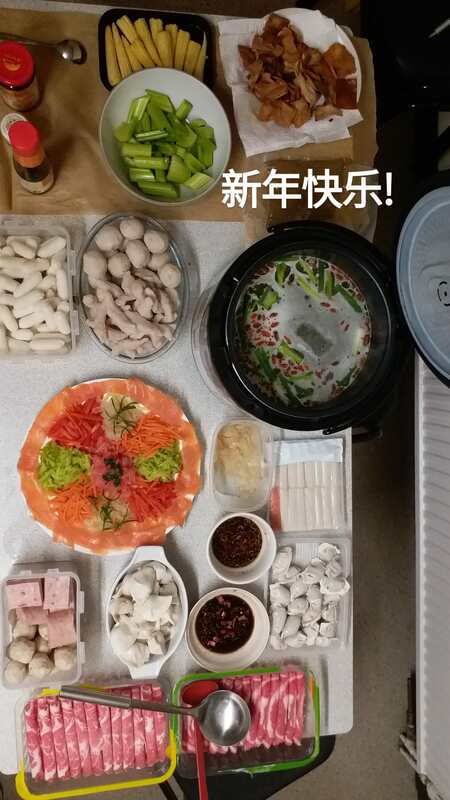 So, this year I decided to take matters into my own hands and host a private little CNY dinner. 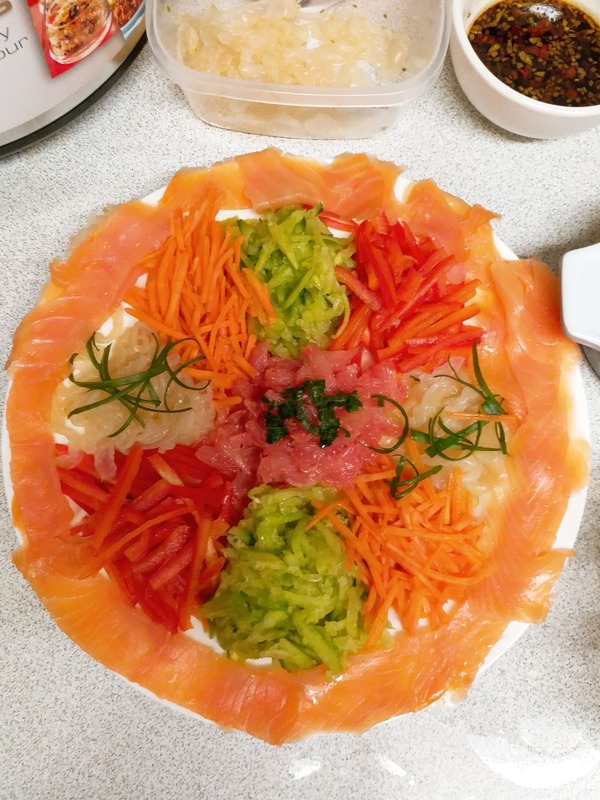 I decided to go with Yee Sang and a hot pot feast with a somewhat flexible budget. 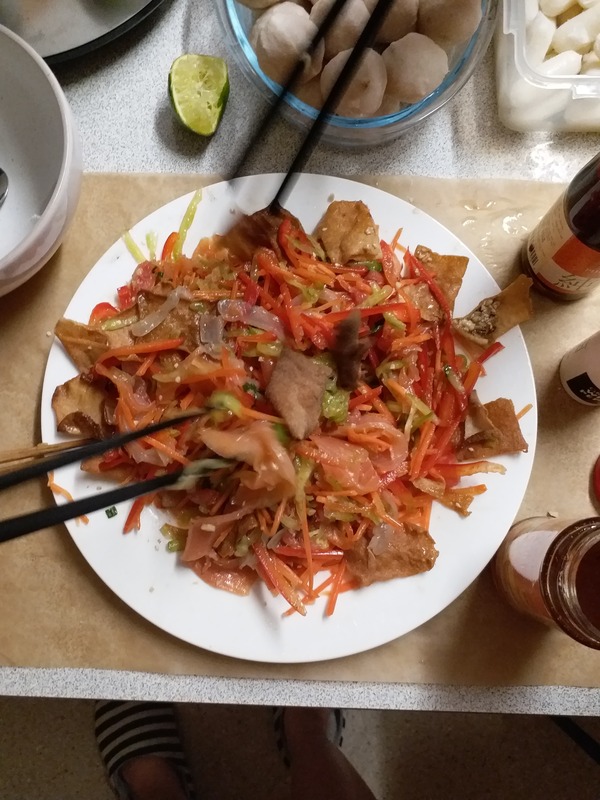 It was my first time making a Yee Sang but it really was always my favourite part of a CNY reunion dinner so I decided to introduce it to my Hong Kong and Chinese friends. It turned out deliciously amazing and I made sure to stick to the traditional recipe as much as possible. 捞生啊！ I do not know how to rotate images here, sorry! (You could probably turn your head or laptop). But yeah, I am proud of it and it made me happy that my friends appreciated and were happy with the dinner. I hope to do it again next year! That’s all from me for now! Buh bye!